Finally Cell Phone Set number twenty-four arrives. Took a little while. BUT, you have to know this - I have the next two sets already picked out, lined up and ready to go and get posted. That gives you at least a little something to look forward to. The top photo is of the "Holiday Skating Center". As you can tell by the sign. 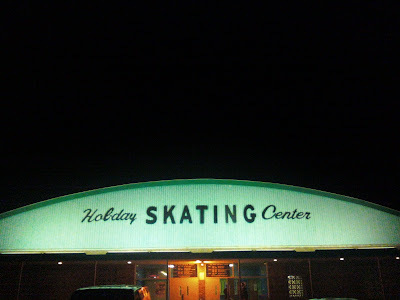 The Holiday Skating Center is located in New Jersey, very near to Philadelphia. Every Tuesday they have a live organist playing live organ music: Carnival style, Neil Diamond covers, Americana, etc. And every Tuesday all the older pro's come out. The oldest skater is probably in his 90's and a the world champion "shuffle" skater. "Papa John" is his nickname and you can find him there, mostly likely smiling. Clean, safe, adult, sport, olde thyme fun. Serious American culture, the "almost forgotten" kind that I pay special attention to. The middle photo is of a mummer on New Year's Day. 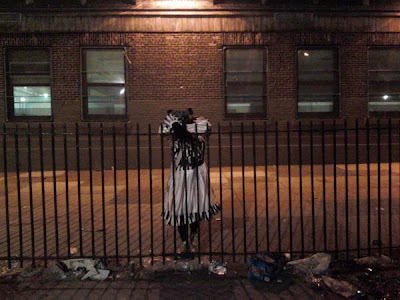 A sad future for the mummer's? You tell me. A sad future for our city? You tell me. A sad future for our country? You tell me. I cleverly named this one "The Lonely Mummer". The bottom photo was taken in Providence a while back. 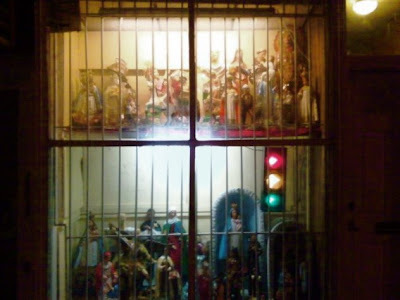 Catholic knick-knacks. I love these things.